I have never seen halters so unique before. All of the patterns and colors really stand out. For Current News, Check Facebook! Keep up to date with us on Facebook. See new product sneak peaks, take part in giveaways and talk about horses! Sun Horse Tack manufactures horse equipment including; horse halters, saddle pads, equestrian themed tee shirts and apparel, breast plates, head stalls and horse shampoo. 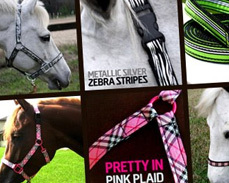 We also make dog collars and other small animal supplies inspired by our horse tack. All products are handmade in Jacksonville, Florida.